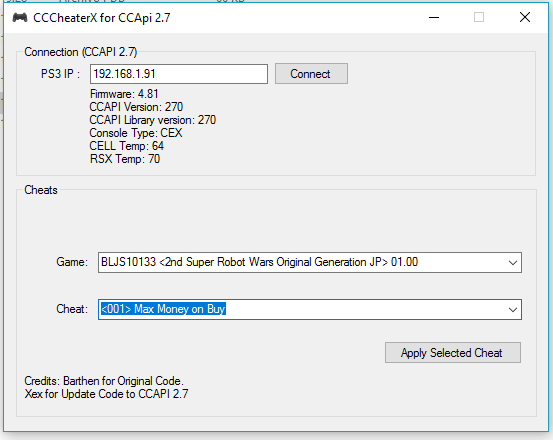 Today developer darkxex has released an unofficial version of CCCheater named CCCheaterX. Check out the release notes and the download link provided below. Hi, first sorry my bad english, i am Chilean and speak spanish, today I started to update the application called CCCheater to work with CFW 4.81, I also added to show the temperature, console version, and a notification on the console when you connect without problems. The original work is of Barthen, i just rework the app for CCAPI 2.7, I really do not know if Barthen is alive or not, because I use forums in Spanish like elotrolado.net for the scene, and I was looking at google, but I did not find any updates since 2014 from the barthen application. Well that, all thanks to Barthen, and to the creator of CCAPI who left the documentation to implement the new library for 2.7.